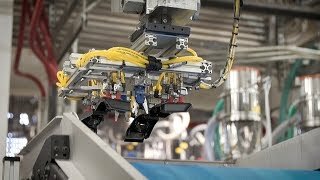 Industrial automation is transforming production and logistics processes, driven by the continuous strive for efficient production and improved quality. Piab's smart solutions help thousands of customers all over the world to unlock value through moving things faster, safer and with less energy consumption. Piab has pioneered vacuum automation since the 1960's and is an innovative partner to end users and machine producers in e-commerce logistics, food, pharma automotive and other manufacturing industries, providing smart solutions for any moving and gripping challenge. By leveraging the ongoing technological development in automation and robotics, broadening the product offering and targeting high-growth industries and geographies, Piab is well positioned to become the global leader in gripping and moving solutions.